We must innovate the process of innovation. In an exponentially changing world, if our value creation processes are not exponential, we will fall behind exponentially. Our economy is turbulent and demanding. Over the past three decades job growth and prosperity have dramatically slowed in America and many other developed countries, including Japan and the European Union. 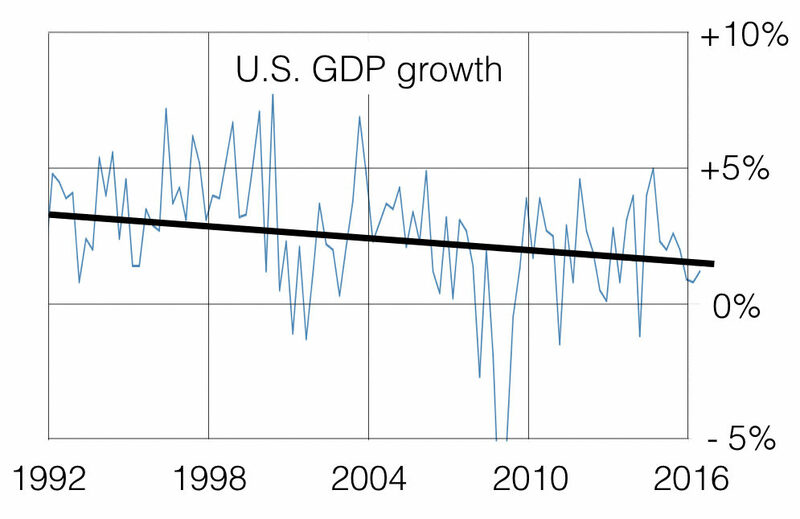 In America GDP growth has declined from 4% in the nineteen nineties to under 2% per year. This growth rate will not produce the jobs and prosperity needed. If not addressed, this decline will cause major disruptions across society. The early signs of this are already apparent. Going forward America must significantly improve its innovative performance while educating the world’s most innovative workforce. Larry Summers suggested that this poor performance might be the “new normal.” Robert J. Gordon believes this decline is structural and is, in effect, inevitable. Part of his argument is that society’s major innovations have already been invented with little of significance left to be done. This seems highly unlikely in an age where systems biology will transform health and lifetimes, 3-D printing and other technologies will transform manufacturing, and autonomous vehicles will transform personal transport, product delivery, and the very nature of cities. Almost every aspect of society is open to major new innovations. That will happen, but will there be jobs? One aspect of our decline is our inability to innovate fast and efficiently enough. Improving our innovative performance by two or more times would significantly impact GDP growth and job creation. Is that possible? The key is to adapt to the demands of our age. Today’s innovation economy has four distinguishing properties. 1) Many technologies improve at rapid exponential rates, 2) global competition is intense and increasing, 3) there are unprecedented opportunities for major new innovations, and 4) emerging global markets are huge. Confronting these challenges is daunting. Most companies and countries are failing to adapt to these powerful dynamics. America’s competition will increase dramatically over the next few decades. In China two million people move from the countryside to the city each month. Going forward America is competing against two new cities the size of NYC every year. The pace of innovation is accelerating. As exponential improvements in information, communications, and artificial intelligence technologies advance, they create new tools and capabilities. The positive feedback from these developments makes the world increasingly transparent and competitive, further accelerating the pace of innovation. Companies are finding it more difficult to survive. In 1930 large companies on the S&P 500 list had lifetimes of roughly 70 years before dying or being bought. Now their lifetimes are well under 20 years. Some data suggests their lifetimes are only ten years. For the first time in U.S. history 200,000 more companies are failing each year than being born. Ominously, for the first time in 30 years, America’s labor productivity has declined. That is curious because information technologies and automation were supposed to increase labor productivity. Even in Silicon Valley most venture capitalists lose money. University “tech transfer” programs are mainly unsuccessful absent a major drug license, like NYU’s Remicade. Output from National Laboratories is, at best, episodic. DoD’s R&D efforts are often profoundly expensive and out of date by the time they are completed. Almost all measures of innovative output show poor results. Going forward America will not have the most RD&I (Research, Development, and Innovation) professionals or the most resources. China has more honors students than America has students, and Asia already spends 50% more on RD&I than the U.S. For America to win its share of jobs and prosperity it must leverage its core strengths and work smarter. The need for greatly improved innovative performance is being amplified by automation. Autonomous cars, trucks, and buses will eliminate up to three million jobs. Over the next decades various forms of automation may eliminate half of today’s jobs. Robotics, 3-D printing, bio-engineering, plus many other exponential technologies, along with new business models like Uber, will reshape almost every industry. Our innovative performance is like the poor product quality before total quality management (TQM) in the 1960s. At the time America arrogantly ignored the brilliant process innovations coming out of Japan and millions of U.S. jobs were lost. We finally woke up and now everyone uses some version of those transformational innovations. Product quality and cost have improved tens to hundreds of times. I strongly believe insignificant improvements are possible in our value creation results as well. Given today’s poor results, many government RD&I agencies are rethinking their initiatives and policies. Too often the impact of their current initiatives is inadequate. In Finland, the lack of RD&I success resulted in a 50% cut in Tekes’ funding, their equivalent of NSF. In America I-ARPA and ARPA-E were modeled after DARPA, which is generally considered to be the world’s most successful innovation agency. Japan’s ImPACT program for creating major commercial innovations was also modeled after DARPA. Singapore’s CREATE initiatives are joint RD&I centers between their universities and others, such as MIT, Cambridge University, and ETH Zurich. NSF created the I-Corps program to teach students and others the basics of successful value creation. DARPA also uses “grand challenge” competitions to create new innovations at the speed of the innovation economy. Today only a few professionals and enterprises have the innovative skills and value-creation processes to identify and systematically develop major new opportunities. The few that do, such as Apple, Google, P&G, SRI International, and IDEO, are all leaders in their fields. Improved innovation processes are being developed, such as Agile, Lean, 5DoI, and Innovation-for-Impact (i4i) described on this website. In addition, companies are increasingly using other models, such as the X-Prize and Google-X “grand challenges” to drive innovation. On-line competitions from Kaggle and many others are producing impressive outcomes. These programs are showing that large systemic improvements can be made. What today’s successful company, government RD&I, venture capitalist, and university programs all have in common is the strict adherence to proven innovation best practices. The key ingredients are: 1) a focus on important opportunities, 2) complementary teams composed of the best practitioners, 3) a “playbook” for value creation, and 4) intense, continuous team ideation using a value proposition framework. To be systematically successful, all these ingredients must be in place. If the opportunities are not important then they are rapidly overwhelmed by global competition. Only the best, most committed teams win in our hyper-competitive world. The playbook assures that everyone on the team has a shared understanding of the concepts and processes required for innovative success, such as the definition for a “value proposition.” See note below. Intense, continuous team ideation is required because rapid learning is required to stay ahead of exponential improvements in technology and intense global competition. Very few companies or government RD&I agencies strictly adhere to these best practices. As indicated with the examples above, they can be applied in many ways, but in every case they are essential for success. They are just the start. In the coming decades America will be in a profoundly more competitive and challenging world. Even better best practices must be invented and used. An example is the next generation of collaboration platforms, which facilitate synchronous and asynchronous value creation by globally distributed teams. Ad hoc innovative approaches guarantee failure. Only the rigorous application of innovation best practices can lead to systematic world-changing R&D and high-value innovations. Increasingly universities are responding to these challenges. They understand that students need innovative skills to thrive in a world where rapid, constant value creation is a necessary life skill. For example, Finland created Aalto University, an “innovation university” with a comprehensive projects-based curriculum. At Stanford University, the highly desirable d.school and Bio-X experiential programs are now emulated internationally. WPI pioneered a highly-influential projects-based curriculum in 1970 called the WPI Plan. It includes team projects performed around the world, including in India and China. Olin College has more recently pioneered one of the most far reaching projects-based curricula, with no discipline-specific departments and no tenured professors. As previously with TQM, the comprehensive use of innovation best practices can produce transformational results. Improvements in innovative impact of ten or more times are possible. As importantly, developing a U.S. workforce where engineering graduates understand and apply these skills will allow America to continue to lead in the creation of new, high-value, global innovations. Larry Summer’s “new normal” calls out for a new way of working to unleash the abundance that is all around us. We must again innovate the way we innovate. It starts by using proven value creation best practices.. Note: Value proposition definition: An important customer and market Need, addressed by a unique and defensible Approach for the solution and business model, with superior Benefits/costs when compared to the Competition and alternatives. This is referred to as an NABC value proposition.